I’ve been researching netbooks for about a month and now that I booked a flight to return to Australian in April/May, I was thinking of buying one pretty soon. I had been considering either one of the Acer, Asus or Samsung netbooks since they seemed to have the best value and the best reviews. I even took a trip to Tottenham Court Road (electronics road) so that I had a chance to test run them. I realised that trying the keyboard and trying to type was going to be one of the biggest influencing factors, with most of the hardware specifications pretty close. Since I wanted something that I felt could last one of the long airplane legs on the way to Australia, I decided up the N140 with its 5900mAh battery apparently lasting for up to 9 hours (of course I imagine realistically it to be a couple of hours less). 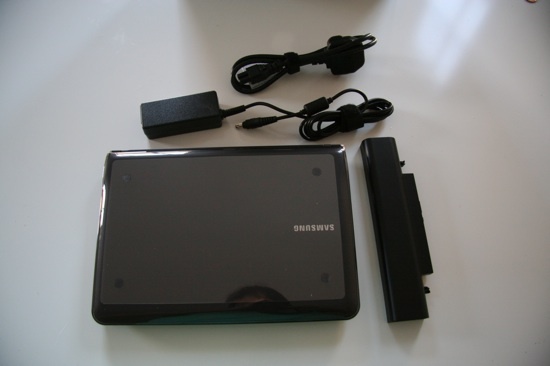 I then stumbled across this, announcing the Samsung N210 upgraded model. I also noticed UK Amazon had some in stock. I debated buying it thinking about all the different dimensions I wanted. It qualified for my budget (sub £300) at £297.05 and I figured the extra hard drive space, and the latest processor meant that its 5900mAh battery life would be somewhat extended (purportedly 11-12 hours) as a result. I made the plunge Wednesday night (almost midnight in fact) and it surprisingly arrived before the weekend just by standard delivery. Brilliant. 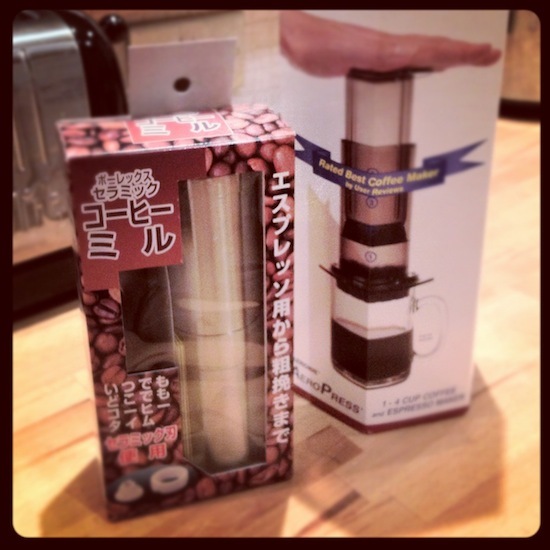 Thanks Amazon. As you can see in the picture below, the box itself isn’t very large. Amazon sent it in another box and although they didn’t really use a lot of scrunched up paper to cushion it, it still arrived intact though you could feel this box inside the Amazon one moving if you shook it. Its initial size looked really promising (remembering I haven’t had a netbook before). There’s basically two parts inside the box, the laptop sitting in padded cushions on top of another small box containing the packaged cables and manuals. 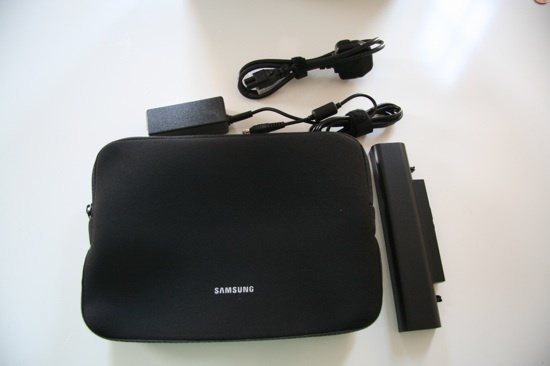 Here are all the accessories that come along with the netbook. 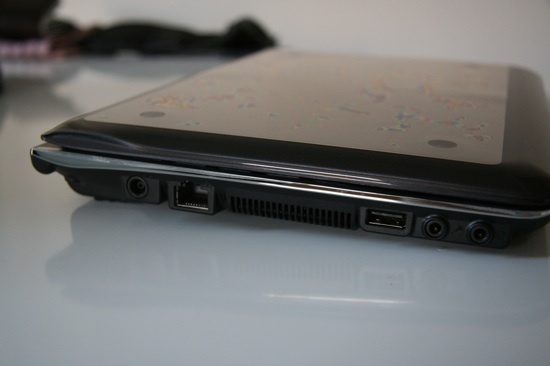 When I first picked up the netbook, I was particularly surprised at how light it felt. Admittedly it didn’t have the battery attached, but even with that now, I haven’t had any trouble carrying it around town in a shoulder-sling bag. I’d even consider carrying the charger around as it, too, is fairly light. 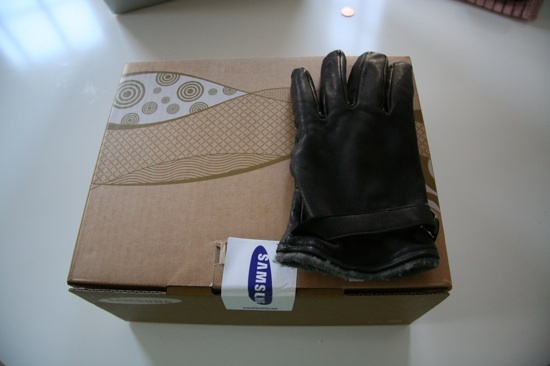 Samsung thought ahead and included a Samsung-branded neoprene laptop sleeve as part of the package. It’s a great thought though it’s a shame it’s so cheap because I now plan on replacing it with a much stronger, tougher-feeling sleeve. I would have kept it, even with its branding, had it been a quality make. I’ll probably find a Crumpler Gimp that will fit it. Having said that, it’s still a great thought and I’ll definitely use it until I can replace it (hopefully it won’t be too soon). I’d mentioned before it’s important to test the keyboard, and from most of the various reviews, Samsung keyboards all tend to be pretty well respected. I like the fact the keys are full sized. 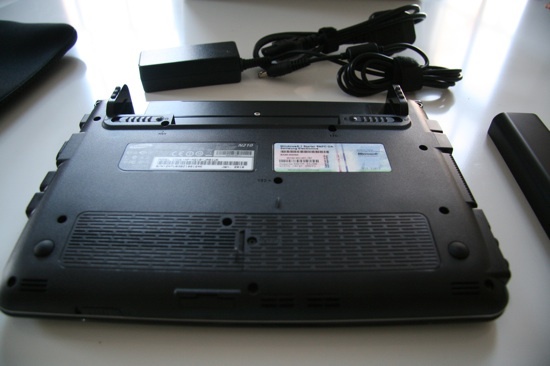 I read about horror stories of netbooks with tiny keys, making it impossible to type properly. I’d also read about the keyboard on a similarly new N150 that failed to impress with its keyboard. Fortunately, the chiclet-style keyboard, works like a charm for typing normally. 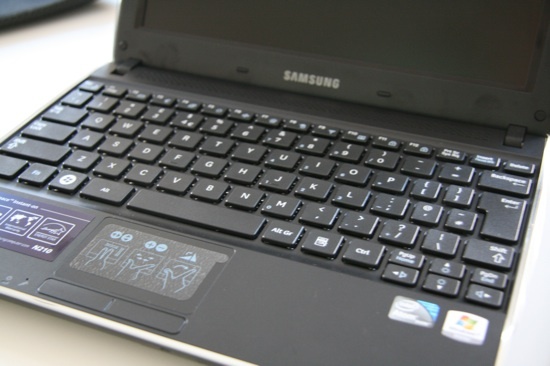 Just like any netbook, you need to get used to the placement of much less used keys but it’s bearable. 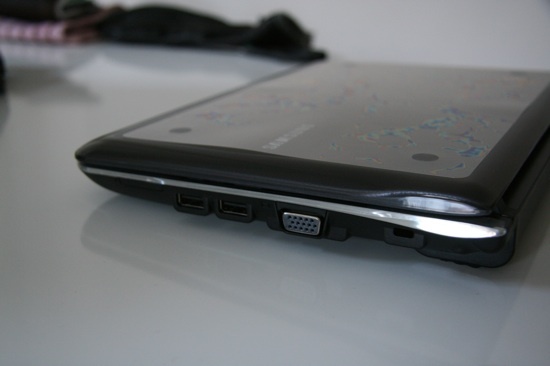 You can also see the tiny trackpad visible in this shot. I haven’t had too many problems with it, although you need to press the mouse buttons with some force as they need to really recess into the body to activate. I think you get used to this after a while. I’m not really a trackpad sort of person, preferring the pointing stick style, but it does the job reasonably well. The trackpad’s not large but then you’d expect that of a netbook. Here’s a picture of the back (before the battery clips on). Note that you need a screwdriver to replaces its harddrive or memory. The external ports for this machine should be unsurprising for a netbook. On this side, you can see two USB ports, a VGA out and a place to hook a security line. On this side, you can see the power outlet, a 100/10 network port and a “chargeable” USB port including headphone/microphone outlets. The great thing about the “chargeable” USB port is that you can have the laptop off, and with the right setting configured, charge any USB powered devices without having the entire machine on. A nice touch. So I’ve had it over the weekend and what do I think? Setting it up was fairly easy with pretty much automated prompts taking me through installation of everything. It has Windows 7 starter, and it’s less of a Samsung thing than it is a Microsoft thing but it still took about four or five various restarts to install itself properly. A whole lot of Samsung software gets installed automatically. I doubt I’m going to use a lot of it although there are a few nice pieces for configuring some system settings. Once charged (I noticed it took between an hour and two hours to fully charge), I detached it and had it connected to my local wi-fi, downloading various freeware components to install. I wasn’t too bothered it took a long time to install various bits and pieces, after all it is a netbook optimised for lightweight applications, not for processing intensive pieces of software. It all ran rather smoothly. Launchy – Kick start applciations, and add various macros for doing simple things. I’m not yet used to the Windows 7 interface so this helps me be productive without it. It’s also great without needing too much screen real estate. IrfanView – I use this all the time for quick viewing all files. The netbook suffers a bit trying to load up high quality/size pictures from my digital SLR (4MB each). Paint.Net – A great photoshop substitute thats freeware. Firefox – Who wants to really use IE8? Chrome – It’s great to have another alternative than IE8. Notepad++ – A much better file editor than the one built into windows. Skype – For making calls over the internet. The Samsung N210 has impressed, doing all it says on the tin. I’m interested to see how long the battery life lasts as long as it does, but the comfortable full-sized keyboard and its battery performance will be useful if you just want to do notetaking/writing as much as I tend to do. I can imagine disabling the bluetooth & wi-fi you might even be able to push it even further. I’ll also be looking for ways that makes Windows 7 run faster so if you have tips let me know. I’ve already pruned the startup list of services (both in services.msc and msconfig) and turned the theming optimised for performance instead of presentation. Inspired by the Okonomiyaki stall at Sunday Upmarket, I thought I would try making this Japanese pancake delicacy at home. It shouldn’t really be too hard, after all, the recipe is a simple pancake batter with cabbage and pretty much anything else you want for topping. Okonomiyaki sauce is a key ingredient to the dish, and it took me quite a long time to find it as well, scouring almost every grocery store in Chinatown. Only one of them had a sauce properly labelled as Okonomiyaki though I was going to give up and just try the Tonkatsu sauce. 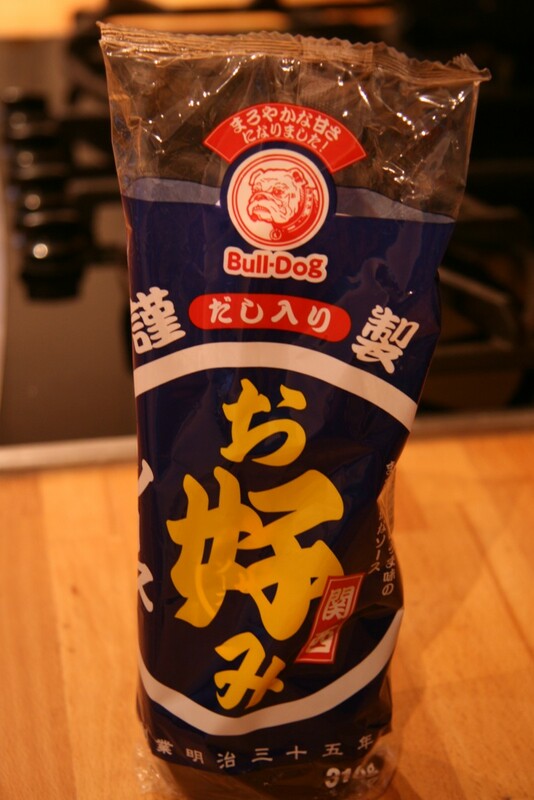 For the record, I found the famous Japanese Bulldog branded Okonomiyaki sauce at the New Loon Moon Supermarket, though I realised later I should have headed straight to the Japan Centre located near Piccadilly as it seems to have almost everything you would ever want from Japan. 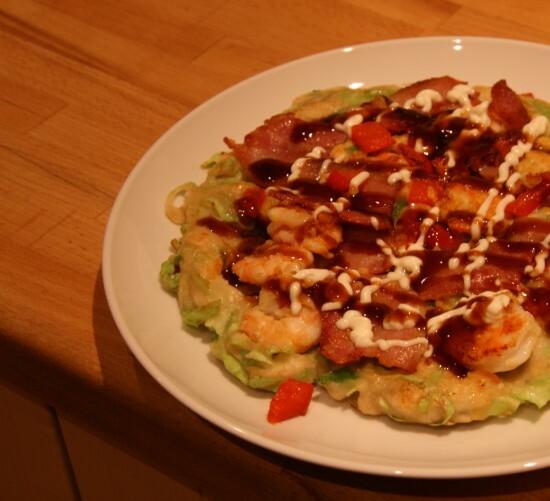 Since you can add pretty much anything you want to Okonomiyaki, I decided to follow the pork and prawn mixture I’ve enjoyed at Abeno Too, substituting smoked streaky bacon for the pork. I didn’t buy the fish flakes that dance like they’re alive, nor the seaweed bits but with the mayonnaise and okonomiyaki sauce still tasted delicious. Last night I had a few people around at my flat for a bit of a catch up. Mike, currently visiting from over in the States, who’d recently bought an iPhone fortunately had it with him so we all got a little hands on sneak preview. Strangely he’s had to take the sim card out since they can’t disable global roaming at the moment and would cause his bill to sky rocket. The iPhone looked a lot smaller than I imagined it would be, approximately the same size as the current standard iPod. The interface is simple, with a single button at the bottom and everything else controlled via either motion or touch sensors. Its interface is, for the most part, very intuitive. For example, unlocking the phone simply requires a finger drag from left to right across the “lock” icon displayed on the screen. Predictive text input is much more advanced, context sensitive if you’re web browsing or texting and autocorrecting based on the letters in the vicinity (and not just the buttons you pushed). My most favourite bit was definitely when you put the phone into iPod mode. Turning the phone on its side turns it into a visual display of all the albums where you can flip through each and every one that’s currently on your phone. A flick of the finger moves either left or right, and a longer drag results in a much faster way of going through them all. Visually very satisfying! I can’t say that I’m going to convert any time soon considering I’m pretty happy with my current phone and can’t really justify the premium. I needed a new memory card for a new gadget of mine, and thought that I’d look to see how expensive things were here compared to the States since I’m heading there for Christmas. 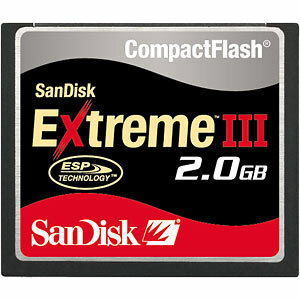 After looking around for best prices for the Extreme III CompactFlash 2GB card, the most reasonable looking place I could find was a place called Picstop. It’s got fantastic reviews, and even with the weak USD, the card ended being only about USD5 more with shipping. I ordered it on Friday morning, the card was shipped that day, and even with standard shipping the card arrived at the office on Monday morning. I even posted a couple of queries via their website (which isn’t exactly going to win any awards) but got some fantastic customer service. Definitely check it out if you’re living in the UK and need something for your Digital camera.